Artists must provide their own table, chairs, and any other needed equipment and be ready to sell by 5:00pm. Artist booths will be in the new, private event space, which has doors for load-in and load-out right next to it. We are planning on parking the food truck near these doors rather than the main taproom entrance in order to drive more customers to the Bazaar. $15.00 + Advertising Help = 8ft booth space. A volunteer will be greeting vendors and taking payments upon arrival. Cash or check accepted. Please make checks payable to Miskatonic Brewing Company. By keeping booth fees low we expect all participating artists to aid in the marketing of this event. See Marketing below. By tradition, the Miskatonic Bazaar serves as a platform to give back to the communities, organizations, and non-profits around the world. Each participant is expected to donate a portion of their proceeds to a recipient of their choosing. See Donations below. - Please check-in and make your booth fee payment upon arrival before loading in. - For now we will try to fit as many artists on the side drive and the rest will park in the North lot. - See map image below for parking info. - Please have your booth broken down and cleaned up by 8:30pm. Feel free to stay for some drinks and music in the taproom! - Free parking is available for everyone. 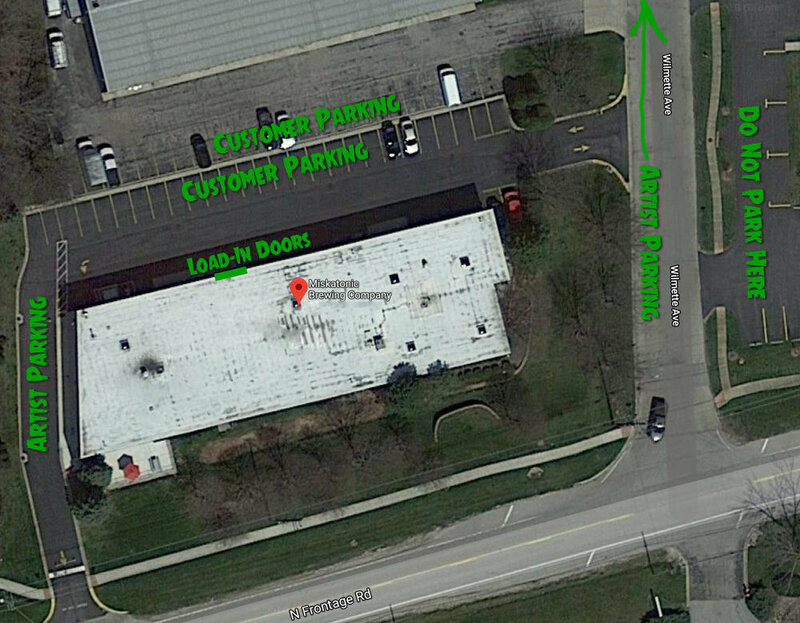 - Please refer to map for artist parking after load-in. - You may bring your own food and beverages with you and access to a fridge and microwave(maybe) if needed. - Must be 21+ to purchase and consume alcohol. - A menu of local restaurants who deliver is at the bar. - Please bring your own chair. - Extension cord if you need power. Power outlets not guaranteed. In order to keep booth fees lower than most other events, and to create a more successful event for everyone involved, we ask that each artist aid in marketing the Bazaar event. This does not require participants to spend additional money. Visit and follow Miskatonic Brewing Co. on Facebook and Instagram and please tag accordingly in your posts. Invite your family, friends, and fans via social media, email, snail mail, messaging owl, whatever it takes! Taking the time to invite your fans to the Facebook event page, sharing the event to your social media platforms, and emailing fans has been a big help in the past. Each artist will receive digital marketing material via email of images to use in your emails, posts, and IG Story. In keeping tradition, we expect every participant to donate a portion of their proceeds to a recipient of their choice. A portion of Miskatonic's proceeds will benefit Worldbuilders, a charity founded by author Pat Rothfuss in order to use the collective power of readers, fellow authors, and book lovers to make the world a better place. If you are unsure of who to donate to, check out the list of organizations previous shows have helped below! Donations are made on Scouts Honor. We will not be taking a portion of your sales, only your booth fee. It’s up to you do take care of donating! Consider Donating To These Organizations! This list is based off of what Bazaarians from both previous shows and this upcoming show support. Please mark yourself down as "Going" and invite your family, friends, and fanbase! Parking along Wilmette Ave is available if (when) the parking lot fills up. Now Accepting Artist Applications for the June 21st Summer Bazaar! In order to maintain a variety of artists and the sanity of those of us who organize and run this event, we're asking that all interested parties please apply for our Bazaar events using our Artist Submission form. Thanks!